I’m on a bit of a rhubarb trip at the moment- in our house it’s going in just about anything, primarily, my mouth (I jest, but seriously; salad, granita, posset, sorbet, you name it). It’s got a versatile tart flavour and brilliant pink colour (if you buy the forced variety) which lends itself to so many recipes and pairs with lots of other ingredients, so naturally I’ve put it into a cake. 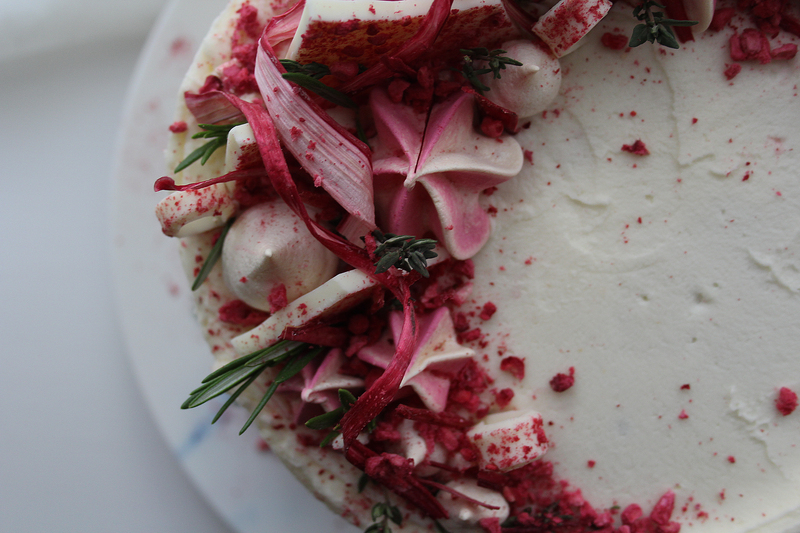 This lightly flavoured thyme cake is sandwiched with a tart rhubarb compote which partners beautifully with the sweet white chocolate buttercream. 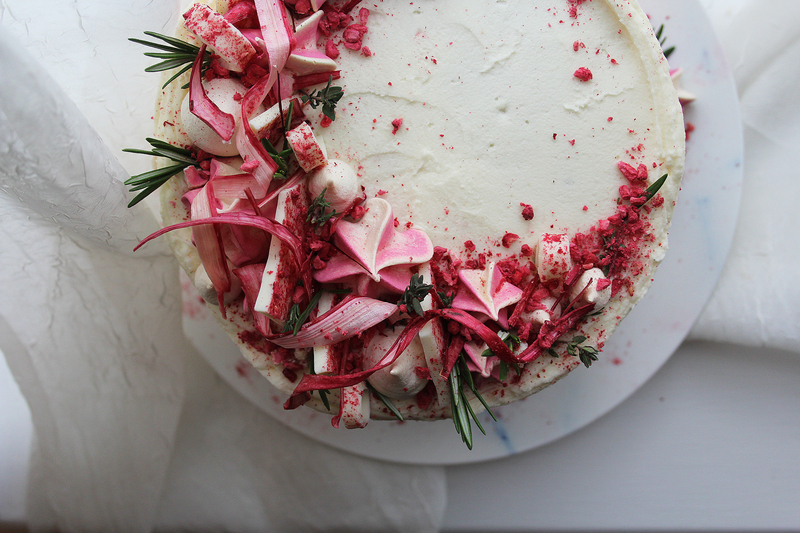 Try it out and top with candied rhubarb ribbons and herby decorations for a statement nod to the season. Preheat the oven to 170c and grease/line two 7 inch cake tins. For the cake, place all the ingredients in a large mixing bowl (or bowl of a stand mixer) and beat (with paddle attachment or electric beaters) until light and well combined. This all in one method is so easy and so long as you don’t over-beat results in a lovely even sponge. Split the batter between the two prepared cake tins and level out. Bake for 40-45 minutes or until a skewer comes out clean when inserted, and the tops are springy to the touch. While the cakes are cooking, make the rhubarb compote. Simply place the ingredients in a saucepan and stir occasionally over a gentle heat until the rhubarb breaks down and resembles a loose jam. Turn off the heat and set aside. Once the cakes are ready leave to cool in the tins for 10 minutes then turn out onto a rack to cool completely. While the cakes are cooling make the buttercream. For this just beat together the butter and icing sugar until really light and fluffy, then add the melted white chocolate (ensuring it is cool) and milk and beat again for a couple of minutes. Your buttercream should be pale (not yellow) and light when it’s ready. To assemble the cake, slice the sponges horizontally into two even layers so you have four in total. 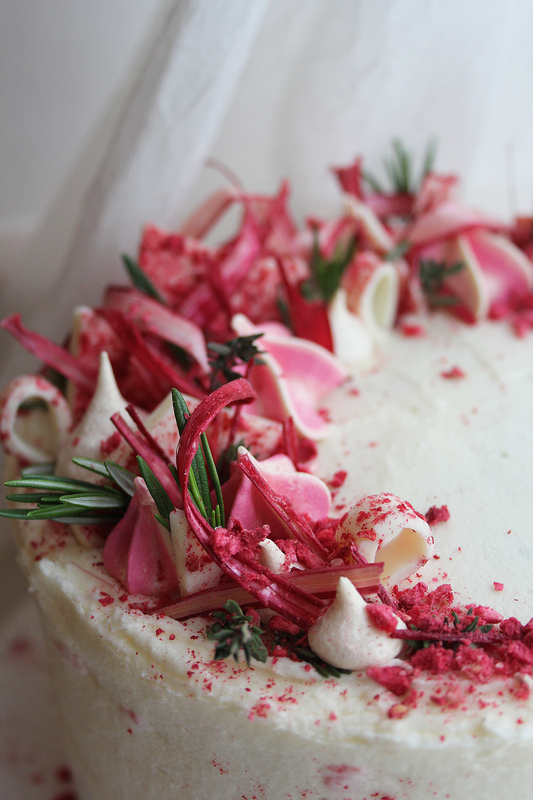 Place one down on your plate/board and spread over a dollop of the buttercream followed by 1/3 of the rhubarb compote. Repeat until you have a 4 layer cake. Take a few spoonfuls of the remaining buttercream, spread a thin layer all over the cake with a palette knife or cake scraper and chill for 10 minutes (this is your crumb coating). 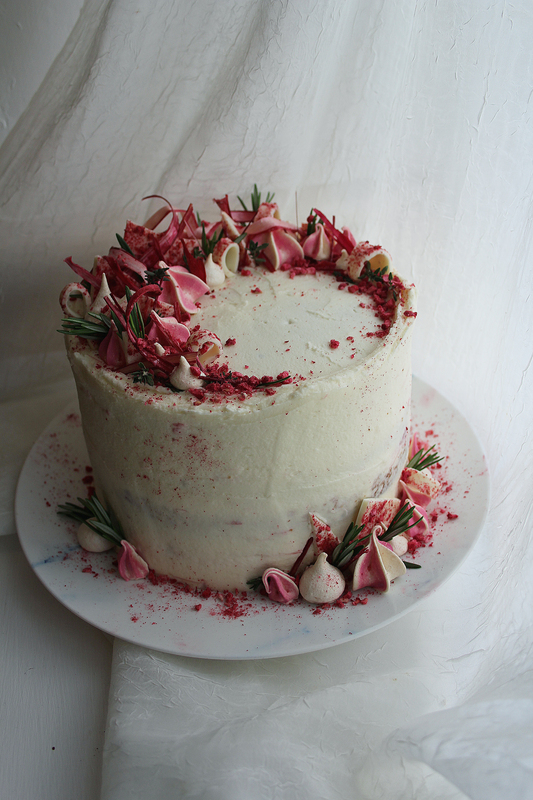 To finish, use all the remaining buttercream to cover the gaps and visible cake (unless you’re going for the naked look!) and smooth down. 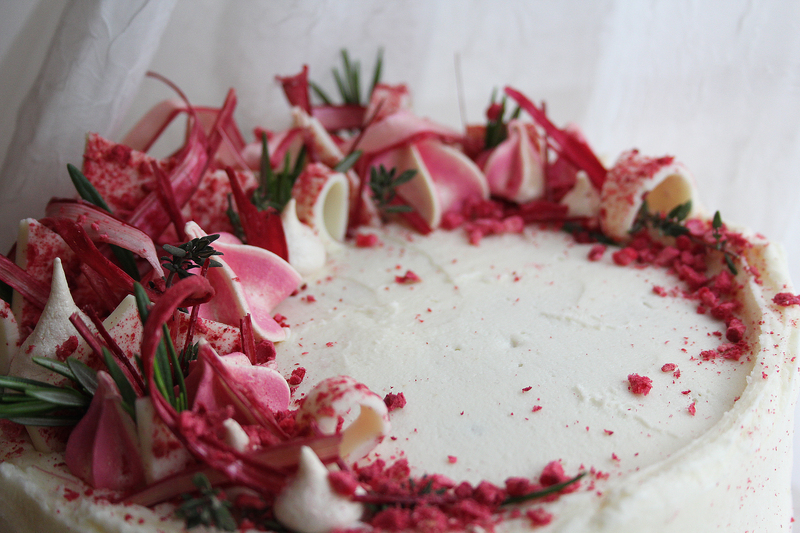 To decorate, use candied rhubarb, mini meringues, herbs, freeze dried fruits and chocolate shards! Drooooooool! Pop the kettle on because I am coming over for a cuppa and a slice of cake.